Mercer Island is an affluent city to the east of Seattle which is located on – not surprisingly – Mercer Island. The island is found in the middle of beautiful Lake Washington which separates Seattle from the Eastside region. The only access to Mercer Island, other than by boat, is by the I-90 Bridge which runs across the island on its way from Seattle to Bellevue. 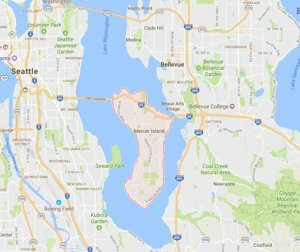 The city of Mercer Island is well known around the Seattle area for being one of the most attractive, and most expensive, places to live. The median home value of properties on Mercer Island is almost $1 Million, with the majority of the properties being single family homes. Looking at the MLS listings for homes for sale in Mercer Island will reveal that lower priced properties are nearly impossible to find, but there is ample inventory of large, well-appointed houses. The appeal of Mercer Island lies in the ability to live in a ‘quieter’ area while still being incredibly close to the big city. Residents of Mercer Island enjoy the natural beauty of the wooden island along with the many parks that it has to visit. Luther Burbank Park on the north end of the island is a popular spot, especially in the summer months. Of course, many residents also own boats that they can take out onto Lake Washington for fishing, water skiing, and more. Residents don’t need to leave the island for basic supplies, as there are multiple grocery stores and restaurants that serve this city of just over 20,000 people. As mentioned above, location is a huge part of the popularity of the island. I-90 runs directly from the SoDo area of Seattle across Mercer Island an on to Bellevue. This means that no matter which direction a Mercer Island resident wishes to travel, it is a quick trip to both the east and the west. Also, the limited access to the island (only from the north end) adds to the seclusion and peaceful feeling that so many residents enjoy. Thanks to that prime location and stunning scenery, Mercer Island should be considered prime real estate for as long as people desire to live in the greater Seattle area. Those with the budget to match the pricey homes on this beautiful island should take a look at the real estate listings for themselves.